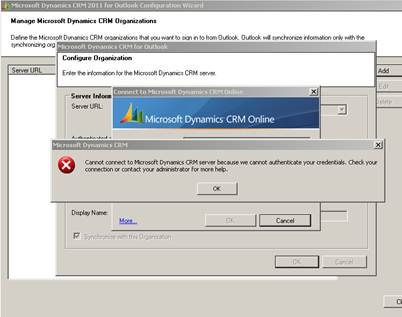 Found a bug in CRM 2011 around configuring CRM for Outlook. I had a customer who had 7 users that could not connect to CRM via Outlook but another user could from the same machine. I saw that the user had a password with a special character in it and when removed they were able to set-up the organisation to connect via Outlook. So if you get the message below check the password . This was a CRM online customer but may apply to on premise as well.